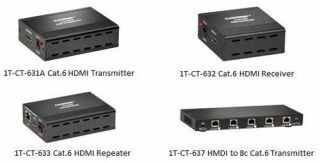 tvONE's 1T-CT-630 HDMI Extender Series has been discontinued. The model numbers that have been discontinued include the following: 1T-CT-631A, 1T-CT-632, 1T-CT-633, 1T-CT-637. Remaining supplies of the 1T-CT-630 Series are limited to stock on hand. Product discontinuation is due to the lack of availability of raw materials.